The body is amazingly adaptable, and possesses impressive recuperative powers. But there are limits, just as there are limits to what stresses will adversely affect the trike. Any little maladjustment in the human body or mechanical trike is magnified thousands of times on long trip. You might get by with a poorly aligned leg or a loose wheel spoke around town and short day rides, but pedaling hundreds of miles day after day will accentuate these problems until they really get your attention in a negative way. A poorly aligned leg may lead to knee damage, while a loose wheel spoke may eventually break and cause others to follow with calamitous results. Here is an example to illustrate the need to get things right. Back when I first got my trike in May 2009, one of the initial things I did was to upgrade the tires from the thin Kenda Kwest 1.25 lightweight rubber to the superior Schwalbe Marathon-Plus 1.75 virtually puncture proof heavy-weight tires. This necessitated dropping out the rear wheel to change the tires, where a quick-release lever makes removal easy and fast. After installing the impenetrable Schwalbe tire, EarthGuard tire liner, and heavy-duty Kenda puncture resistant Q-Tube, I slid the wheel back into the drop-out slot and tightened the quick-release lever. Then, off I went on another training ride for the upcoming trip. Everything seemed fairly good pedaling around town, but it didn’t seem to have the smooth edge it had prior. Had I not shifted down to my lowest gear as a test, the potential exists that the rear cassette cogs may have been damaged once out on the road. The chain would move up onto the largest cog when I shifted the rear derailleur, but then it would immediately drop back down onto the next smallest cog. It did shift through the other sprockets, albeit a little noisily and not as smoothly as I would prefer. Before I changed the tire, it had shifted flawlessly. Turns out that when I reinstalled the wheel into the drop-out slot, I had gotten it in just a slight bit crooked. In other words, the axle wasn’t running quite perpendicular to the chain, which meant that the cassette was also slightly askew … not enough to cause total malfunction, but enough to adversely wear the cogs and chain. Once I made sure the wheel was fully seated at the ends of the drop-out slot, I took it for another ride … problem gone! The shifting was once again great. Imagine had I not had occasion to use my lowest gearing for a while (24 tooth front chainring and an 34 tooth rear cog is only used for the most extreme mountain grades). The other cogs, which were also not perfectly perpendicular to the chain would have been receiving undue wear as the chain would be pulling towards one side, imperceptibly grinding away at the aluminum teeth. Working out the minuscule bugs is critical prior to departing on a long tour. If it doesn’t seem just right to you, take the time to troubleshoot it while still at home! 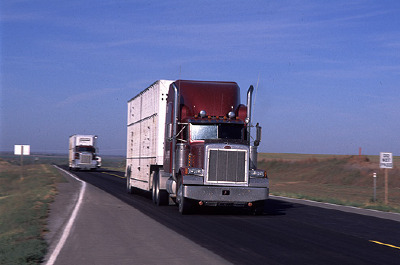 Part of working out the bugs means simulating the trip ahead of time with regards to your cargo solutions. Long trike journeys require considerable thought about how you’re going to carry all the stuff you need, or at least think you need. I thought I needed a lot more than what I really did, and thus towed a large trailer behind me the entire way, something that led to several related issues that are discussed elsewhere. Whether you decide to tow a trailer or not, it is still a wise idea to test all your theories long before you depart into the dark unknown. Now is the time to see what works and what doesn’t, not when you’re 71 miles from the next human outpost. I am assuming you will be traveling unsupported, that is, without a vehicle available for your convenience. I have been passed by cyclists with no panniers, out in the middle of nowhere, happily speeding by me unencumbered by extra cargo weight, and then watched as their supply-laden van brings up the rear. This is great if you can afford it, yet for me and many others of like mind, hitting the road with my own provisions provides a certain pleasure and sense of accomplishment that is hard to describe. Maybe it’s the pioneer spirit in me. Maybe someday if I come into some money, I’ll try a fully supported tour with vans and meals. But in the meantime, I travel on my own, and thus write from that perspective. Being a journalist though, you can bet if I do get to luxuriate on a supported tour, I’ll surely be typing out the nouns, verbs, and adjectives so Trike Asylum readers will be able to read all about my viewpoint on how it went. Of course, if I partake in a petroleum-supported trip, where does that leave my utopian arguments for not toxifying the air we breathe? Okay, back to the cargo simulation plan. Whatever cargo solutions you have chosen, take a few rides fully loaded with your panniers, trunks, and/or trailer to see how it goes. Is it all too heavy for comfortable pedaling? Is a lower small chainring needed to successfully summit the long and steep mountain passes? 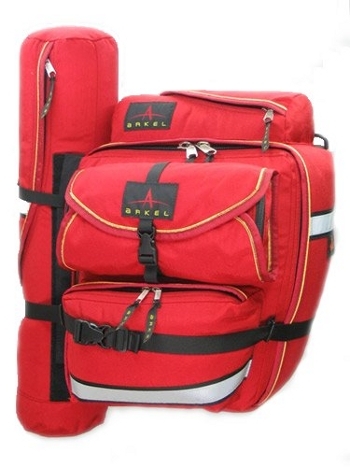 Will all your gear fit into the little nooks and crannies of the bags? Is it all waterproof in case of a storm? Can you get to the most frequently used items easily when you need to? What’s the best way to pack the panniers for maximum storage benefit? Don’t guess! Know before you go! Dry runs are marvelous tools. I sold my trailer after the first long trip, and prefer to take future rides with just what will fit on the trike. Perhaps a few more dry runs would have solidified justifications for going without a trailer on that trek, but then again, I was absolutely convinced, having just come from automobile travel mode, that I couldn’t make it work on the trike alone. I now see major advantages of not towing a trailer. Trike-only travel is perfect for being able to navigate tight places with ease, to be able to back up when necessary, to make myself more invisible at stealth camps, and to lift the rear tire and pull the trike backwards when the need arises (such as if I get stuck on a dirt road). I figure if backpackers can go for days with far less cargo capacity than will readily fit on a trike, then I can make it work too. What works well for me is the following: a pair of Radical Design Lowracer side seat panniers (25 liters), an Arkel Tailrider trunk atop the rear rack (11 liters), and a pair or Arkel GT-54 side rack panniers (54 liters). Radical Design is made in Holland, and Arkel is made in Canada. I have a total of 90 liters storage space to carry all my gear, which equivalent to 5500 cubic inches. This provides slightly more than 1.5 times the room of the typical 3600 cubic inch backpack (like the Kelty Moraine that I own), which is approximately 59 liters, so it’s like having a backpack and a half. That ought to be enough room for just one guy’s gear. All it takes is a little rethinking on how I do things, which is well worth the maneuverability I’ll be gaining. Everybody probably has their own ideas on how to pack their gear and where to put it. For everyone you ask, you’ll get a unique answer, so here, I’ll describe my own method of packing. The first question is where to put my house and bed, in other words, the tent and sleeping bag, as both take up a fair amount of pannier real estate compared to other items. Of course, these shelter and rest components are essential for a comfortable and pleasant tour, so they must be put somewhere. The Radical Design Lowracer side seat panniers are the perfect size. I keep the four-season REI Arête tent in the left side pannier, and the Berkeley goose-down sleeping bag in the right. The sleeping bag has to be placed in a very compact stuff sack to fit in the single 12.5 liter pannier, but it works. Anything I place in the side seat panniers does not count for weight on the rear rack, which has a company-stated limit of only 50 pounds, so since the house and bed are relatively weighty, that’s good news. Everything however, counts towards the trike’s weight limit of 275 pounds, including my own body. Part of the bed and house gear goes into another nifty niche. On the rear of the right side Arkel GT-54 is a Cordura nylon tube-shaped container that is perfect for an inflatable mattress and tent poles, so in there they go. This makes it quick and easy to stash the rolled sleeping pad and poles without having to stuff them in the side seat panniers, if they would even fit at all. Clothing goes in the left side Arkel GT-54, and I have found that rolling clothing is more space efficient and easier than meticulously folding everything. With folded clothes, they either have to be placed flat side down, which takes up room and usually results in things being placed on top of the clothes, or if placed vertically, they always fall over if another item is removed, making the organization in the pannier a mess. I’m a neatnik type of fellow, and demand order in my packing. That’s why the smaller organizational nooks, niches, and pouches designed by Arkel work so well for me. I want to know precisely where to find everything I pack. I wonder how well I’d do with the large one-room solutions like the waterproof stuff bags popular with BOB trailers and Ortlieb. Such an arrangement might become too jumbled. How many pieces of clothing should a trike pilot have on a long trip? There may be times when doing a laundry is not possible, after all, so is it good to stock up on extra duds to span the time without clean clothes? I have traditionally worn 100% cotton clothing during all my outback adventures, despite experts claiming that synthetic nylon clothes are a must for the quick-dry effect. I found out though, that cotton clothes weigh more and take up more space in the pannier. I have now acquired two super lightweight pairs of outback pants, part cotton and part nylon. They roll up even smaller than the cotton pants I took on the last trip, and dry time is definitely faster if I end up washing them in a sink or river. My long sleeved cotton shirts are very lightweight, and dry fairly quickly, so I may just keep them in the mix. I think that two pairs of pants are sufficient if space and weight considerations are at a premium. I take three shirts, but their space requirement is minimal when tightly rolled because they are thin cotton. Keep in mind that one pair of pants is on me, along with one shirt, so only one pair of pants and two shirts are in the pannier at any one time. Two pairs of underwear should do it, although three can work since they require practically no storage space (I use the brief bikini variety, which amount to hardly nothing size-wise). Socks are another story. I insist on a clean pair daily, although I have been known to wear a pair for a second day if there is no other choice. On my first overland trike trip, I packed enough socks for seven days, which would be seen as excessive by some folks. Not only that, but my socks are the old athletic sock variety, 84% cotton, and thick. I like them because they provide extra padding, and they don’t take on a permanent odor after many months of use, like synthetics tend to do, especially polypropylene. I also don’t like my socks to be constrictive around my legs, which reduces efficient blood flow, so the traditional sock works well for me in that regard. I tried a Pearl Izumi synthetic sock, but it was not the least acceptable for me, leaving marked indentations in my legs where the elastic band had been. With blood flow a critical concern in the feet of recumbent trike pilots since our feet are higher than our hips, my personal feeling is that tight constriction in a sock is clearly not an option. As in all things, your opinion may vary. That’s the interesting thing about life. We all have our ways, however odd they may be. What works for me is precisely opposite from what works for someone else. Socks are folded in half and stuffed in with my clothes. By keeping clothing in one place, I get used to where to go when I need them. Logic is my first priority, breaking it only if there’s not another clear option. Keeping all those clothes on the traffic side of the trike may also just help me bounce off any errant motorist whose bumper strikes the pannier (oh yeah, I wish). Well, that’s what my lights and flagging are for. Being a writer, I always bring along a small journal and digital camera. The zippered and rugged journal cover is 5.5 x 6.75 inches. The old Samsung digital camera is a small point-n-shoot variety. These two items together fit nicely on the right side GT-54 in a medium sized pouch that sits on the outside of the main luggage compartment. Again, it seems like the Arkel designers made these panniers just for me, with useful pouches and compartments that match up well to odd storage uses that I have. I also carry along a compact first-aid kit and a stash of items suited for emergency survival needs. There is a low riding compartment on the left side GT-54 that readily accepts the medical supplies, along with a portion of the survival gear, and on the rear of this side is a unique tubular pouch that works well to hold my Swiss-made Katadyn water purification bottle, which is soft plastic and the size of a typical water bottle. If I ever do exhaust my trike’s onboard water supply, the Katadyn bottle will filter out 99.99% of all those nasty microscopic organisms that are bent on making me sick … just scoop up water from a lake, river, stream, pond, or even a small stagnant pool, and then slowly sip away through the filtering straw system. Ahh, the miracles of science! Rather than continue on with precisely where I placed each and every item, I’ll just present the stuff I planned on taking along. Here is the gear list that I originally made up for my first trike trip, including the trike itself. This list has been slightly modified over the first one I made to show what actually did come along. That ought to give you some idea of why I chose to pull a trailer behind the trike for hundreds of miles day after day. Sure, I had an abundance of space, but in the end, I would have rather had the easy maneuverability of just the trike. The Rubbermaid Action-Packer trailer trunk was simply a huge cavernous storage area, where things had to be heaped in as best as possible, kind of the “throw and go” mindset. Every time I took something out, another item was sure to fall into the space left behind. Well folks, this article just passed the 10,000 word mark, and we still haven’t left the driveway! Everything so far seems to be concerned with preparation. 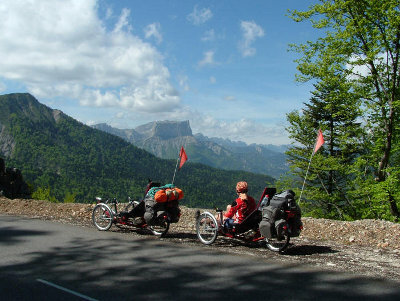 Of course, being prepared is the key to a successful tour on a trike, and in reality, is indeed a massive percentage of the overall considerations and activity. Leaving well prepared will mean the difference between a potentially miserable experience and an outstanding one. One thing most trikers like to know ahead of time is where they are going, although an impromptu “decide as you go” trip could be fun too. Reverse route on return trip, except for potential modifications to circumvent any early mountain pass snow conditions (may avoid Crater Lake by using Highway 97 as a work-around). Anticipated return date: November 30, 2009. By expedition’s end, more than 2,000 miles will have been traveled during this journey without the use of petroleum fuel products. 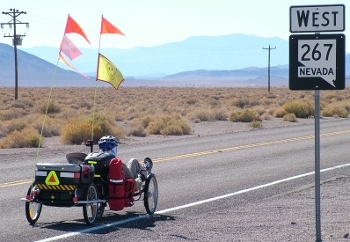 If you’ve already read the story of my trike journey on the Silent Passage website, you know that this route and itinerary was altered due to perilous weather conditions and personal bodily injury. I rolled into Canby, California as scheduled on Day 9 (step 15 on the route), and that is where some deviation occurred. Two days later, on Day 11, my trike found itself temporarily in the bed of a pickup truck, and I kept my feet elevated in a recliner for the next 5 days. 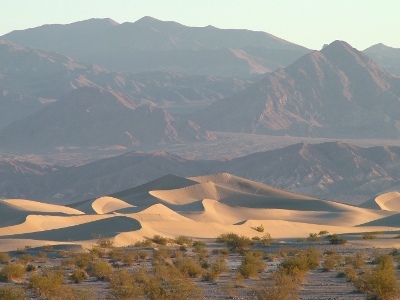 Then, it was back to the route, although in a location farther along, followed by 180 miles of remote triking throughout Death Valley, and up notorious Towne Pass. “The tent is still in the shade when I must arise to offload water. Mind you, I’m just a few yards off the paved road, and there is scant concealment available in the way of trees and shrubbery. Fortunately, I can see enough road in each direction, and any car is also easily detected by my ears in this quiet nearly-natural environment, that no sense of nervous urgency psychologically hinders the business at hand. “As I face the Highway 139, to my left, from whence I pedaled yesterday, is a foothill valley and gently meandering pavement that leads north to Adin, and to my right are steep mountains and curvy roadway that leads south, up into the Modoc National Forest. Straight ahead, across the road are transitional hills covered in pine trees, with the sun about to crest the eastern ridge, and behind me is a picturesque rancher’s field and stream to the west, far below the rocky slope, with a roaming herd of cattle lazily dining on grasses. 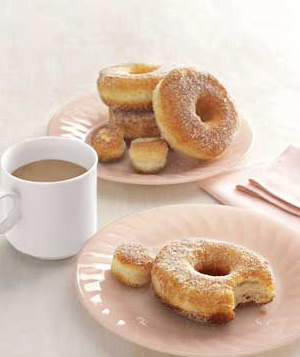 “It doesn’t get much better than this! “Today, Jack Freer is scheduled to meet me somewhere south of here on this road. He has gladly volunteered to give my Achilles tendons a deserved break by scooping my trike, trailer, and me off the asphalt for a petroleum-powered ride to his Gardnerville, Nevada ranch. What a guy! “Although, I must admit a certain hesitancy about this whole thing. After all, my goal is to ride my human-powered ICE trike to give my talk, and I am attempting to steer way clear of gasoline in the process. Now, only on my 11th day out, it appears that I will at least temporarily concede an impromptu setback of my best laid plans. Sure, a little company for a while is welcomed, and sure, letting my tendons return to normal would be nice, and okay, lazing out in a truck for enough mileage to replace several trike days has a certain tempting ring to it after riding and living on the ground for so long … but still, I feel like I am about to cheat on a school test! “Not only all that, but who knows what would have happened to me helplessly in the path of deadly Typhoon Melor’s remnants in the vast Nevada desert. I have this vision of me pedaling for all I’m worth towards the remote outpost of Gerlach, surrounded by the endless Black Rock Desert, and looking over my right shoulder to see the lethal clouds bearing down upon me, thundering their mighty roar of destruction as the rains pelt the dry sands, and the accumulating torrential waters cascade through a massive rocky sandwash. At ninety degrees off my starboard bow the flash flood hurls towards me, and it is clearly evident that I cannot pedal fast enough to escape my entombment beneath several tons of earthen debris! “So, ego aside, I humbly opt to forfeit a few miles in the name of sanity. “I could lie. The conspiracy would involve only Jack and me. No one else need be any the wiser. As far as the rest of the world is concerned, I’m lost anyway, and wherever I show up, my story would be believable. Yeah, I rode the trike the whole way. Never mind those Achilles tendons the size of bananas. I’m a warrior, an animal tough as nails, one who never says die. “One problem with that. It’s not my way. Mental preparation and training is every bit as important as the mechanical trike and physical body aspects of getting ready for a cross-country trike tour. After all, for someone who has never done this sort of travel before, it is usually a very daunting thought, especially if you are going solo and unsupported, which I was. For those of you who opt to try a supported tour, or who have other trike buddies who wish to accompany you, this mental obstacle will be significantly diminished, as our “safety in numbers” human mindset makes abundantly clear. Fear mysteriously dissolves when we have company. All I could do was talk to myself out there. Was I fearful once my initial stages of planning got underway? Sure, although I am fairly adept at controlling fear and getting the job at hand successfully completed, probably an artifact of my years in law enforcement, I suppose. Nevertheless, the thought of me and my trike, alone and moving ever so slowly through unknown distant territory, did have the tendency to unnerve me at times. I had to work at toughening up my mind just like I worked at toughening up my body and trike. We are only as strong as our preparation and foundational work. “I could have approached this expedition in a totally different manner, one that would have been as quiet and hidden as my stealth camps will be out on the road. I could have kept my mouth shut and my keyboard off, thereby notifying virtually no one ahead of time about my plans. That way, if I experienced a last-minute change of heart, no one would have been any the wiser. Of course, had I followed that model of preparation, I would have been totally way out on my own. “Okay, I must admit, there are selfish reasons behind my chosen course of going public with my insanity. For one, getting any publicity one can is always good if one is attempting to sell something, and since I am trying hard to scrape together some ongoing retirement income, book royalties will hopefully play a small, but welcomed, role. Being the adventurous maverick that I am, my life has been one of career adjustments every now and then, so that I would not miss out on something that I might have wished I had tried come retirement. The downside to this ideology is that a huge financial nest egg at 65 is not forthcoming, so now I scramble to make up for it. “That statement became tacked to my wall while I was in high school, back in the sixties. It has served to motivate me for a long time now. Not only has it never lost its power for me, it has intensified in serving as a driving force when self-doubt and trepidation have attempted to get the better of me. “If only they had! Had what? Toured that far-off land they always dreamed about seeing? Taken a chance on love again after years of disappointment? Climbed that mountain while they were still fit enough to reach the summit? Tried an exciting new career offer, even though it meant a reduction in retirement benefits? Chosen a human-powered vehicle to lead the way into a new and cleaner future? “At 6:30 AM on Thursday, October 1st, a reporter from central Oregon’s largest newspaper parked his car in front of my abode. I had eaten a granola breakfast, rechecked all my gear that I had packed the night before, and was now nervously chatting with my friend Matt Jensen in the garage. Departure was looming its head as a dragon would stare down a knight. There was no turning back on this journey I had crafted for myself, my first cross country trek on a tricycle … alone, except for the first 20 miles with Matt on his trike. “The reporter had already taken a few notes, and was now snapping some photos with his large digital camera. First light had fallen upon the landscape outside the garage, air was cool, the time was 7:00 AM to the minute, and there was no further reason not to start pedaling. As I strapped my feet onto the pedals, and pushed the right one forward to begin the journey, a powerful surge of momentary fear coursed through my consciousness as reality truly made itself visible. There was no more talking of this trip in the future … it was now! I was leaving for a long solo ride laced with countless unknowns. “I’ve heard it said that courage is not the absence of fear, but rather moving forward in spite of it. I kept moving towards that emerald city. Matt served the role of tin man, scarecrow, and Dorothy, creating an immediate sense of safety in numbers. I wasn’t in Kansas anymore. “It all seemed so surreal to me. I was aware of pedaling out of the driveway, yet it was almost as though it really wasn’t happening. My senses barely captured anything around me, so intent was I on reconciling the impact of what I was in fact beginning to do. The reporter ceased to exist in my mind. Even though I had planned this to the nth degree, and wanted to do it, a voice within yelled that I should stop, albeit only for the briefest of seconds. I was now pedaling a tricycle to Death Valley’s Badwater Basin, a destination only thought possible via automobile by nearly all rational people. “A well-wisher sent her final verbal thoughts of safe travel to my ears as Matt and I crested the hill to begin the slight descent to the coast highway. I did not look back. Not only is it difficult to do on a low-slung recumbent trike, but to have done so would only extend the emotion-laden transition. 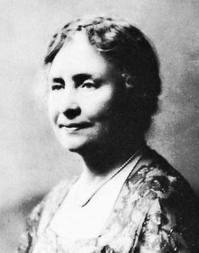 “In an instant, the comforts of home were gone. 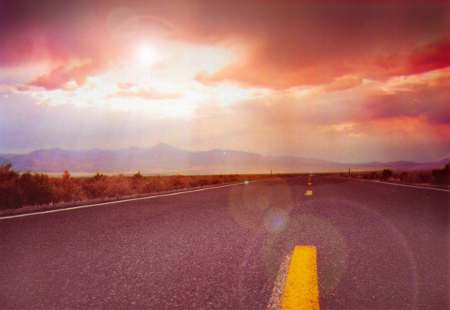 In an instant, my world was now the open road and nature. Just like that! Everything changed in a few heartbeats! My survival now depended on me and what I had brought along. The sting of this conversion was lessened within a few blocks through chatting with Matt as we pedaled our tricycles south. He is a seasoned cross-country solo cyclist, so his reassurance and calm voice played heavily on soothing my spirit … a spirit that had just been traumatically torn from its daily routines. Never underrate the mental aspect of getting ready for a trike tour. It’s real for sure, especially on the first trip anyone takes, and it is magnified if riding by one’s self. Fear of cars, trucks, narrow shoulderless roads, breakdowns, lack of food and water, physical injury, criminal accostment … you name it. If our minds can think it up, we will begin to fear it. The vast majority of mental fears never come to pass, and are almost always wholly unfounded. The mind plays games. We have been brought up watching too much television and going to the theater too often. Seeing Hollywood’s portrayal of human death and misfortune has over-saturated our brains with negativity and violence. Without diligent work on our parts to dismiss this cloak of doom and gloom, it’s darn hard to get moving on a trike tour. What it boils down to is this: Use common sense and be dutiful in all aspects of preparation. I’m not saying that bad things can’t happen to a trike pilot on tour, but rather the chances are that everything will turn out just fine, and you’ll come away with a positive life-altering experience that you wouldn’t trade for the world. How many people are killed each year in their own homes or hometowns? How many people die everyday of heart attacks and strokes, overweight, stress, smoking a pack of cigarettes a day, eating donuts and coffee for breakfast, blah, blah, blah? Where’s the fun in that? If you’re not living on the edge, you’re taking up too much space. Do something different, way off the grid of normalcy. Take a trike trip as far as you want to go. Only those who risk going too far will discover how far they can go! There is no other way. If you wait for opportunity to knock at your door, you’ll be just like everyone else. You can’t cross the ocean by just standing there staring at it. Okay, that’s enough of pumping up the fearless macho portion of the brain! Everyone has some hurdle to overcome, and for most, that was the biggie. This trike tour event you are pondering is one of those things that may well induce significatn mental hesitation, but once you return, by golly, you’re so glad you did it! Essential gear includes a small and lightweight digital camera, by the way! You’ll absolutely want to remember every hour of every day with digital pixels. My epic saga officially began in earnest at 7:00 AM on October 1, 2009. The morning temperature was ideally suited for pedaling a heavy load, and for the first several miles, I actually was wearing a couple of jackets, layered for ventilation, as the coastal air is nippy most every morning. Since my trike buddy Matt elected to ride the first 20 miles with me, things were quite a bit less stressful than if I had pulled out of the driveway all by my lonesome self. At the next town, Matt and I grabbed an early lunch of veggie burritos, chips, and salsa, and then he headed back north on his unencumbered Catrike 700, one heck of a fast trike, powered by one heck of a fit guy. I continued on inland, pedaling my combined vehicle, rider, and gear weight of at least 350 pounds (may have been upwards of 370). It was the classic inexperienced case of over-packing. Due to the extremely remote desert regions through which I’d be traveling in about ten days, my logic dictated that I needed everything I brought. There were 50 pounds of compact and nutrient-dense food in the trailer, enough that I would not have to acquire more for at least two weeks. Breakfast, lunch, and dinner were pre-planned to the bite, based on a 2,000 calorie per day diet, perhaps as high as 3,000, but that would be pushing it. In addition to the 148 ounces of water I had on the trike itself (one gallon, 20 ounces), I had approximately 150 ounces in the trailer. As you may well know, water is heavy. That which does not kill you makes you stronger! Well, I sure was getting stronger … for a while at least, until my daily caloric deficit started adding up. I later calculated that I was realistically burning at least 5,000 calories each day, probably more on days where a lot of mountain climbing was involved. Getting from coastal Oregon to northeastern California and the flatter deserts of northwestern Nevada required ascending more endless mountains than I remembered being there (of course, on a trike, things look different). It was a daily matter of spending hours pedaling uphill and quick periods of speeding down the other sides. The fast and thrilling downhills in those mountains were the happy icing on the cakes of making the top. On a self-supported trike tour, expect three noteworthy things, among a host of others of course: 1) You will eat a lot of food. 2) You will still lose weight. 3) Your overall health and endurance will dramatically improve. Hey, you can’t beat that, right? Most of us love to eat, but a long trike journey lets us do so and still mold ourselves into better physical shape. It’s a win/win situation as I see it! 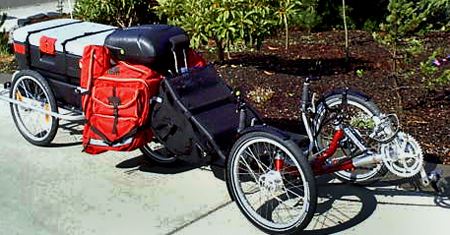 Trike touring brings all manner of roadway and terrain under the three tires. Unfortunately, the human governments of Planet Earth are not the slightest bit concerned about the mental state or physical well being of people using human-powered vehicles to move cleanly through the environment. All they can think about is fast and heavy automobiles and the economy. Cyclists are invisible to nearly all governments, although recently a precious few local municipalities are slowly coming around to constructing roadways in a manner that is consistent with safe travel for cyclists. Any cyclist, whether a hinterland roamer or an around-town pedal pusher, knows that municipal, state, and federal governing bodies have done next to nothing to facilitate scenarios where the oft-quoted “share the road” credo is realistically achievable. For example, my state of Oregon does in fact have a “Share the Road” law that requires petroleum-powered people to courteously share all public roadways with vulnerable human-powered humans such as us, yet this amounts to mostly “feel good” lip service. On the Oregon Coast Bicycle Route, a road with which I am intimately familiar since I live four blocks from it, and a road that Oregon touts nationally to draw in thousands of cyclists every year, there are many hair-raising portions where a triker or biker can very easily be struck, injured, or killed by a car or truck. Several key sections of the 364 mile route are so dangerous to cyclists that you wouldn’t believe it unless you saw it! 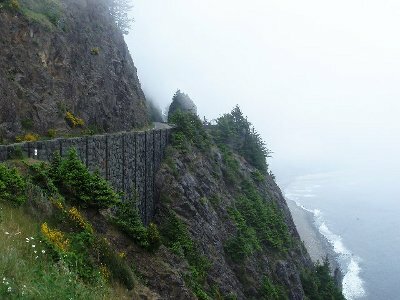 Long portions of the Oregon Coast Highway 101 have plenty of shoulder for a trike or two, but when the pavement winds steeply upward along the precipitous cliffs of the Pacific, shoulders routinely disappear, forcing trikers to ride in the lane on “blind right” curves where a car may quickly come upon you before the driver even realizes you’re there. It’s usually very easy to tell when such a nerve wracking situation is about to occur: Oregon posts a small yellow sign with a bicycle logo and the words “on roadway” so that alert and caring motorists will keep an eye out for us … but what about all the other drivers who are intent on watching the big blue ocean, or those who simply believe that cyclists have no right to be on “their” highway? And this doesn’t even take into account irresponsible motorists who text-message or cell phone while driving. Not only that, but the warning signs are small, often faded, and easily missed on a road crowded with summer tourists. For trikers going down the grade, speeds of 40 miles per hour may be attained, thereby mitigating the danger somewhat, but for trike pilots going up, the speed is more like 4 miles per hour, most definitely a hindrance to cars traveling 40 to 50, especially in blind curves with a cliff on each side and absolutely no way to get off the road even an inch. These same issues, along with many others, are found in every state and around the world. My Oregon example can easily be transferred to where you live, for we all struggle with the desire to ride in mental comfort. I have attended a multi-agency meeting where the topic was how to make the coast route hiker friendly the entire distance, as I am also a hiker. When the most notorious section of the highway came up for discussion (Yachats to Florence), my suggestion was for the agencies to work cooperatively towards a pedestrian/cyclist solution, thereby solving two transportation mode issues at once. It was positively received, and while nothing will likely change anytime soon, perhaps at least I planted a few seeds for the future. I have also been working with my municipal government on making the town a safer place for human-powered people, and the incoming civic leaders are not the “business as usual” variety. They are very open to initiating meaningful changes, such as the National Complete Streets Coalition suggests. Okay, I’ve used up some textual real estate here on my soapbox, but it’s leading up to a couple of important points that all trikers may find of interest. First, these changes nationwide and worldwide will only occur if we all get involved at the local levels, where we actually may have some clout. I am surprised how open the officials have been so far, and ever optimistic for a favorable outcome, although I don’t expect miracles either. Second, until such time that governments across the country actually do take cyclists seriously, we have to cover our own behinds out there on the road while we tour. In these days of diminishing petroleum and increasing pollution, perhaps our voices will be heard, where our words have traditionally fallen on deaf ears. How many dead cyclists does it take? All this is not to spook any potential trike tour enthusiast though, as there are many ways to remain relatively safe in a world fixated on fast and heavy automobiles. Prior to my Oregon coast to Death Valley journey, I fell pray to well-meaning friends and family who pointed out every harmful thing that was likely to happen to me out there. These dire heartfelt warnings most often centered around being struck by a car or eighteen wheeler. My experiential findings by trip’s end however revealed a much different reality. Truckers turned out to truly be my friends. They always gave my little trike and trailer wide berth. Car drivers were also exceptionally polite and patient overall. Most passed as though I was a standard automobile whenever the oncoming lane was free enough to do so. I had no instances that led me to believe my life was actually about to be cut short. During the trip, I was expecting an irritated horn honk from time to time. This did not occur. Sometimes sympathetic drivers, or those who were also cyclists, gave a friendly honk and wave, which really boosted my spirits and hope for humanity. I have to say that my first cross-country trip was essentially free from scary incidents, and as I progressed each day, any lingering pre-trip fears melted away to nonexistence. So what is it with all these fears and warnings traditionally given to trikers? Why are some trike pilots and bicyclists too fearful to leave their residential neighborhoods? Here’s the way I see it, now that I too am an unprotected bag of bones pedaling along in a sea of steel cars: Human nature frequently seems to seek out that which is frightful, distressing, and dreadful in life. Look at any newspaper, online news source, or evening newscast on television. What do you read, see, and hear? Mostly, these commercial entities spew out how many people were killed or hurt today and how it happened. Why do they do this? Because their stats show increased viewership when morbid topics are presented in all their glory. If viewers were turned off to this type of presentation, media sources would change their delivery paradigm, as their bottom line is always financial growth … as fast as they can achieve it. They give the public what the public wants because this will result in the largest revenue flow. Ratings are what it’s all about, and that is why we have become a nation overflowing with fear, anxiety, and panic (inducing rampant fear in their citizens is also a key tool governments use to take their nations willingly to war). How often do we see the media present how many people survived and how they did it? Or how many good things happened to good people? Sure, a few of these things are discussed, but they inevitably are buried later or deeper in the news source. What am I getting at here? Well, for every cyclist who is killed or maimed by a car, there are literally hundreds of thousands who are not, and these positive statistics go on day in and day out, while the unfortunate isolated incident happens once in a blue moon. Yes, I could be hurt on tomorrow’s ride, but will that stop me? How many people still drive cars, even though 50,000 humans are killed each year doing so in the United States? Have you given up your car? Likely not, because the chances of a mishap are minimal enough that you feel secure in continuing a potentially fatal activity. Common sense dictates that on our trike tours we exercise reasonable prudence, and take levelheaded precautions to ensure a fun and safe journey. These same principles are useful for triking around town also, where increased cross traffic is another noteworthy consideration. What is the key component to trike survival? What are some strategies for surviving on a car-dominated planet? Most drivers have never even seen a human-powered recumbent tadpole trike before, so when their gaze falls upon your highly visible and weird machine, you have their undivided attention … guaranteed. You are so utterly bizarre that they will usually slow down to figure out what the heck you are. It’s hard for a car driver to strike an object that has his full attention! Time and again this has held true on all my rides, both locally and interstate. Add to this some attention-getting devices, and you’ve just dramatically increased your odds of not getting a grill plastered in your face. A flagpole at least 6 feet in height, as measured from the ground. This places your flagging at a level visible from most car’s windows. A brightly colored flag, or two, or three on the flagpole. This is like a neon signboard grabbing the attention of everyone within eye-shot, even a motorist a full block or more distant. A brilliant red LED tail light with multiple bulbs. This gets you noticed even on a sunlit day if you have a powerful light. A bright headlight. Although not quite as important because it is not visible to the rear where the cars are coming, it’s still a good idea in case you get caught out near sunset. Several reflective day-glow green stick-ons. These can be placed anywhere on your trike or helmet, and show up well even in daylight, but especially at night. A bright day-glow green over-shirt. This clothing is worn by savvy cyclists worldwide, and will make you visible for many blocks, especially from the front where cars can cut you off if they turn in front of you. Anything else that’s bright and you like on your trike.